At the weekend I got to meet again one of my favourite Knights, a drink swilling glutton, incorrigible rogue and all round, in many senses of the word, fun-maker. In Elizabethan costume and regaling a full tavern, I can imagine he would love the KMSA. I refer to of course, Shakespeare's Immortal character Sir John Falstaff. What makes portly Sir John so entertaining? How is it, when his actions would repulse many in both a modern and medieval context, we find ourselves so attracted to this lying tub of lard? Speculation over the years has produced many possible answers, one no more likely than the next. 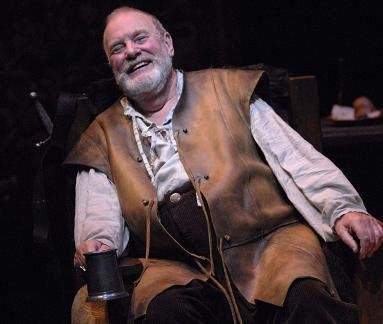 Whether or not the Queen of England truly requested Merry Wives of Windsor... for herself because she was so fond of the "huge hill of flesh" (Henry IV pt I, Hal, Tavern Scene), most do find some sort of affectionate connection. Possibly his openness in his crimes, his lack of loyalty being so apparent — essentially his frankness (not so much honesty) in life, and his grinning self-determination, self observance. So there we were, meeting up with other members of the London " If You Write It...They Will Come " Culture Club, at the Founders Arms on the South Bank of the Thames opposite St Paul's Cathedral, a few blocks from the Globe Theatre, where we were to see that evenings performance of The Merry Wives of Windsor. Of course we got there in good time to have a hearty Falstaffian meal of Beef Pie, Chips and Swede all washed down with a good quaff of foamy Young's Special 6.4% Ale. Then fully watered, our jolly crocodile wove its way through the ancient streets to the Globe Theatre. 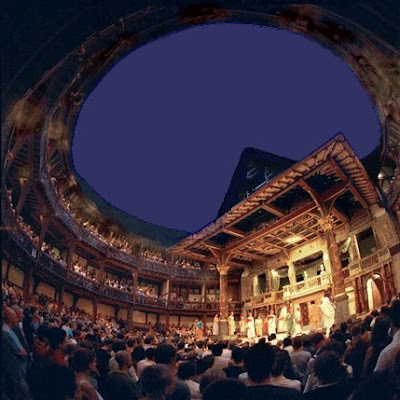 The Original Globe where Shakespeare premiered many of his plays went up in flames. On June 29, 1613, during a performance of Henry the Eighth, a theatrical cannon, set off during the performance, misfired, igniting the wooden beams and thatching. According to one of the few surviving documents of the event, no one was hurt except a man whose burning breeches were put out with a bottle of ale. Although it was rebuilt, it was once again shut down to decay completely away, by the Puritans in 1644. 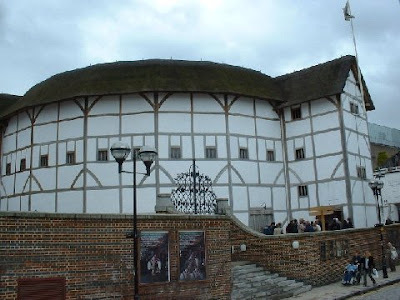 Then in the 1990's, due to the amazing Vision of the American Director Sam Wanamaker, a third Globe was funded, constructed and opened in 1997, a completely exact copy, in every beam and design, of the former which stood not 200 yards away. The dusk turned dark blue, the crowd thronged noisily into the heart of the theatre just as the peasants did in the original over 400 years ago. They chomped on hazelnuts and drank ale, but we were full to burping, and huddled close, under the clouds that scudded between the thatched roofs. Finding our way to the front...there he was...the Knight Colossus, Foaming, Fun and Fulsome. 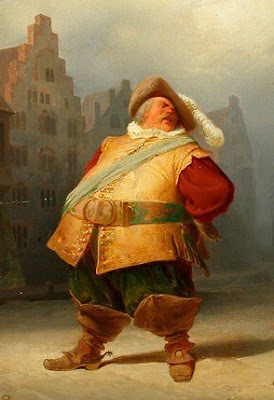 the indefatigable Falstaff, flirting with the married Ladies, who secretly loved his attention, never winning, but living life to the full, and leaving us to chuckle our way back to the Tavern to toast his flawed but very Human soul. A good Knight was had by all.... All Hail The Ale. 1. The opening lines of the blog I thought you were referring to me. I do resemble those remarks, especially the girth the older I get, or the more beer I drink, not sure which to blame. 2. Falstaff was another piss of an American beer brewed here in Evansville many moons ago. 3. I enjoy flirting with married ladies. I flirt with one every night, Lady Allwinky. 5. Where are the English Knights of Moleskine, Spirit and Ale? It seems that those you enjoyed a the Young's with (Though it should have been the Well's Bombardier Ale) would be perfect members of our Merry Band! O, what men dare do! I must say, you fun-makers do know how to make merry -- there is method in the madness. Yes, all the world's a stage for the Knights of MSA.